Boston Baroque made love and war last weekend, with a mostly sparkling program that yoked together that perennial odd couple, Venus and Mars - or at least their equivalents from the French baroque: Charpentier's martial Te Deum and Rameau's romantic La Guirlande (The Garland) - with an orchestral suite by the same composer serving as a pillowy buffer between them. First came Charpentier's Te Deum, which may be the most familiar of this composer's works to modern ears, as its gleaming Prélude has been widely sampled (and is in fact the signature fanfare of Eurovision). But after that rousing march, this long-form motet becomes curiously conflicted (in a way that feels somehow typical of Charpentier), as it swings at will between the martial and the melancholic. The net effect is of a battle hymn that's at least partly a requiem - an intriguing interpretive challenge, and one that I couldn't argue conductor Martin Pearlman fully met; but as Charpentier's writing is quite complex - and quite remarkable - throughout, it felt like enough that most of the Boston Baroque performers were exemplary. The brass section (Jesse Levine, Robinson Pyle, and Paul Perfetti) was in particularly fine form - in fact I've never heard period brass sound quite this polished. Likewise timpanist Jonathan Hess knew he was on the spot, and came through with a sparkling attack; and later, violinists Christina Day Martinson and Sarah Darling both shone in a touching (if brief) duet. But the winds seemed hesitant here and there when it came to the eccentrically lilting rhythms of the French baroque, and the singing was slightly variable. Leads Amanda Forsythe and Andrew Garland both sounded fine, although he seemed to be singing in a later mode than she; but other soloists stumbled - struggling with ornamented passages, or just singing a shade too softly. Luckily the chorus came through with cohesive power and sensitively inflected diction. All in all, this was an impressive, if not quite perfect, take on this exquisite work. The life of Jean-Philippe Rameau (at left) of course overlaps that of Charpentier, but they're worlds apart in terms of style. In his commentary from the stage, conductor Pearlman cited Rameau as "the first great orchestrator" - meaning, I suppose, that the French idea of the orchestra as color palette probably begins with him. And what can I say? Probably - Debussy (perhaps the ultimate colorist) famously agreed - although what strikes me most about Rameau is his sense of dramatic effect rather than his sense of color in the pure sense; and Pearlman's reading of the composer in the orchestral suite that filled out the program only re-inforced that feeling. Drawn from various opera/ballets (Zaïs, Platée , Zoroastre and Les indes galantes), the piece was all skittering, high-wire piccolo lines and bold, bright gestures in the brass. Its longest and most adventurous section was the "Chaconne" from Les indes galantes - which famously demanded (perhaps for the first time) a ballet with a narrative; but its extended development didn't make too much sense without an actual danced performance to watch along with it (actual period dance remains the key ingredient missing from most of our early music performances). 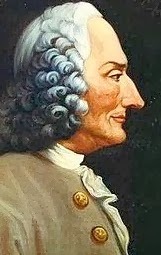 Still, Rameau's wit, and effects such as the droning bag-pipes of Platée, charmed throughout. Finally came the main event - and another charmer - Rameau's La Guirlande, which given its clever, compact story and sweetly ravishing vocal lines, I'm surprised is still somewhat obscure. 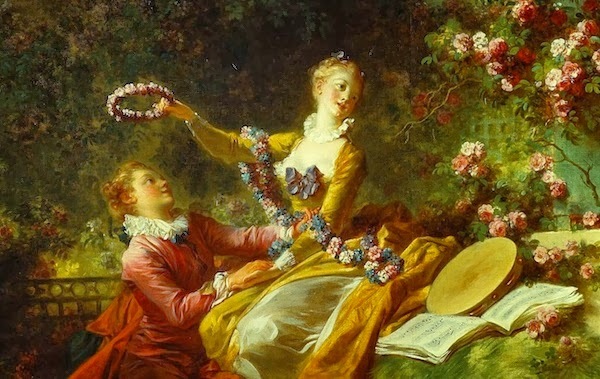 Indeed, The Garland feels rather like the musical equivalent of a sketch by Fragonard (above, The Lover Crowned, from the Frick), in which two lovers, Zélide and Myrtil, a shepherd and shepherdess - needless to say - reunite after a sojourn apart. They both bear flowered crowns which Cupid has promised will remain fresh as long as they are true; Myrtil's, however, has withered, as his eye has wandered. Abashed, he leaves it on a shrine to the god, hoping it will be renewed (and his love along with it); clever Zélide, however, discovers it and replaces it with her own - thus allowing Myrtil to pretend he has been faithful, but at the same time begging that he forgive her for her own seeming dalliance, as her flowers (i.e., his own) are now faded. It's an elegantly poignant device - and somehow very French in its logic (Jean-François Marmonte was the librettist). At Boston Baroque, I felt the staging was perhaps a bit too arch - for the piece to reach its full emotional impact, Myrtil should perceive the meaning of the stratagem by which he has been redeemed; and to be honest, the sparkling Amanda Forsythe is almost too sophisticated a pure-tone presence for the forgiving Zélide. But this ever-luminous star sang like a wounded lark, and tenor Lawrence Wiliford proved another find for conductor Pearlman, who by now has a history of introducing remarkable vocal talents to Boston. The American-Canadian tenor sang with a forceful, heartfelt attack that wasn't always under complete control, but mapped superbly to Myrtil's impetuousness. A wry cameo was provided by baritone Andrew Garland (yes, another garland), and the chorus and orchestra sounded as ripe as a summer field in May - although once again the uneven rhythms of the slower dances gave the winds a little trouble. And alas, there were no actual dancers; but perhaps next time! Till then, I'll remember with great pleasure - like musical forget-me-nots - the exquisite duets between Forsythe and Wiliford.